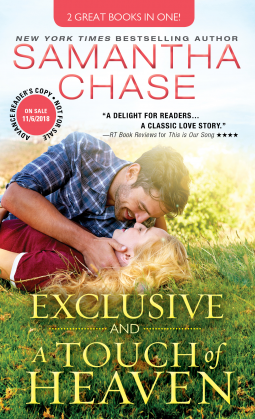 Exclusive by Samantha Chase is an addictive read. The chemistry inside is explosive. I could not stop reading. The banters between the characters was fun. I kept on erupting with laughter and my smile continued to spread like a wildfire. Heat, action, mystery and a whole lot of emotions sparking everywhere inside this book. An exclusive encounter lands a female writer back to an old friend. One that held her complete interest. Yet nothing ever came between them. Until they separated from each other. But now, it was like going back into the past and finding they still feel the same way they did. A reclusive man doesn’t his quiet life erupted. Until now…he wants something more in his life. And he is positive a particular woman he knew is the answer. But getting her to come to him will prove challenging. Yet this time, he’s not giving up on her. Hot, intense, and cleverly spun. This novella is a must read. A Touch of Heaven by Samantha Chase is full of nothing humor and heat. I felt like dying from laughter. This story was just too good. I fell in love immediately. The mother-daughter work and family reminded me of my own family. Chaos, crazy, and emotionally good. Samantha Chase slowly built up the smoldering heat in this book. But once I caught the sparks flying, I was in deep. The couple had this combination of personalities that made me smile the entire time. Sassy, strong, and clever-the good daughter works hard for things. It’s just who she is. Then enters in a complicated situation with a man that makes her crazy. This equation was epic. Overall, A Touch of Heaven is a sweet yet steamy romantic love story. One that left me feeling happy and crazy in love.